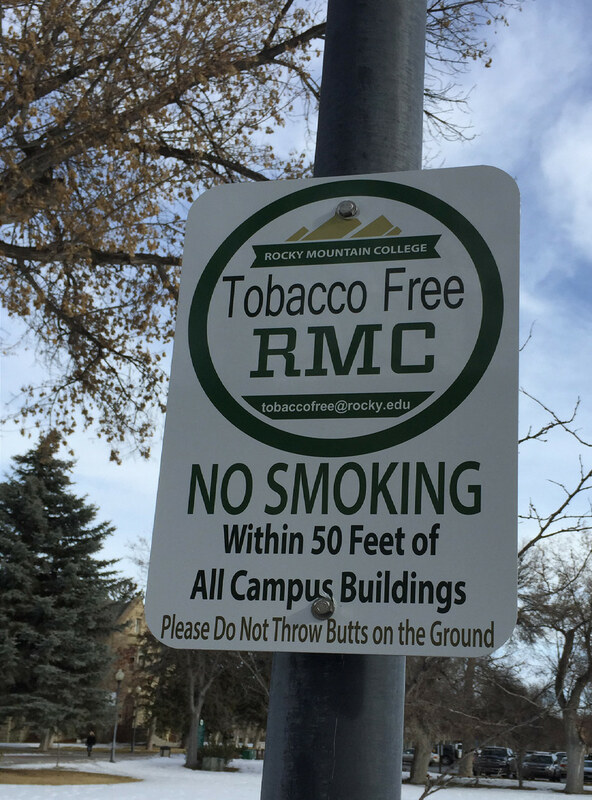 Rocky Mountain College is experiencing a huge push towards a tobacco free campus. However, the educational material I’ve seen on this issue unfortunately only presents one side. The main question is if we, as a college, should be limiting the legal right of a student to smoke a cigarette or chew tobacco. I would like for all of us to consider the majority of people at Rocky Mountain College, students and staff included. A typical student or staff member is above the age of 18 and therefore has a legal right to smoke. Should we limit this freedom just because we don’t agree with the unhealthy decision they’re making or because there is a slim chance another person may be affected by secondhand smoke? Those in support of the RMC Smoke Free initiative love to point out all the facts and statistics about how smoking is bad for you. is is generalized information any rational thinking person is aware of. Yes, smoking is bad. We get it. However, if students choose to be unhealthy, then that’s on them. It isn’t the school’s place to ban tobacco products based on the fact it may be unhealthy for the smoking student. Lifestyle freedoms should be left to the judgment of the individual, not the College as a whole. That is part of growing up, making your own decisions and not have someone dictate them for you. happy to move away if politely asked. The overall message we send as a college to tobacco-using students and staff is that they are not welcome. is is not a good message to send students, especially because Rocky is a place where students should feel comfortable and at ease. is ban is instead hand picking a group of students whose lifestyle choices are being unfairly targeted and making students feel ostracized. So is the tobacco ban really about protecting the students who have a slight chance of being affected by secondhand smoke, or is it really just attacking personal rights of the individual on campus? is is an issue of personal choice and it is wrong for Rocky to step on those individual freedoms. This entry was posted in Issue 7 and tagged Chew, Cigarette, Freedom, Liberty, Molly Davis, Tobacco, Tobacco-Free RMC. Bookmark the permalink.